where will you get clean water? 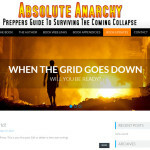 We are happy to launch this website, an interactive guide for the Absolute Anarchy - Preppers Guide to Surving the Coming Collapse book by Johnny Jacks. Provide your name and email address to receive important notices on future updates and news.